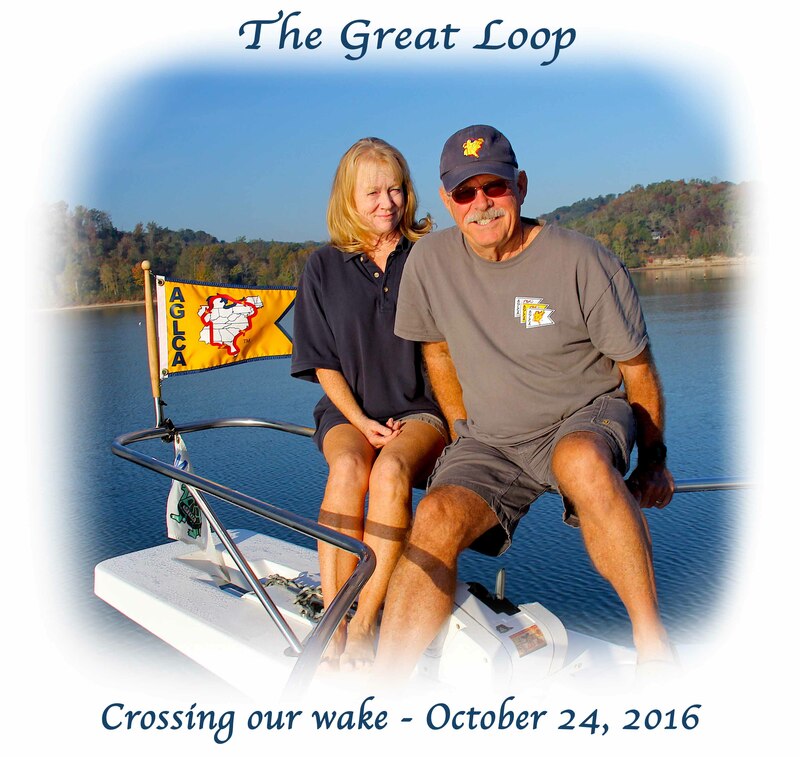 10/26 – 31/2016 Summary: We left Buzzard Rock Marina on 10/26/16 and headed south, which is really “up” the Tennessee River on Kentucky Lake. (Don’t sweat it; it confused us too.) We found the lake/river journey to be very enjoyable and scenic with lots of bird life to enjoy. 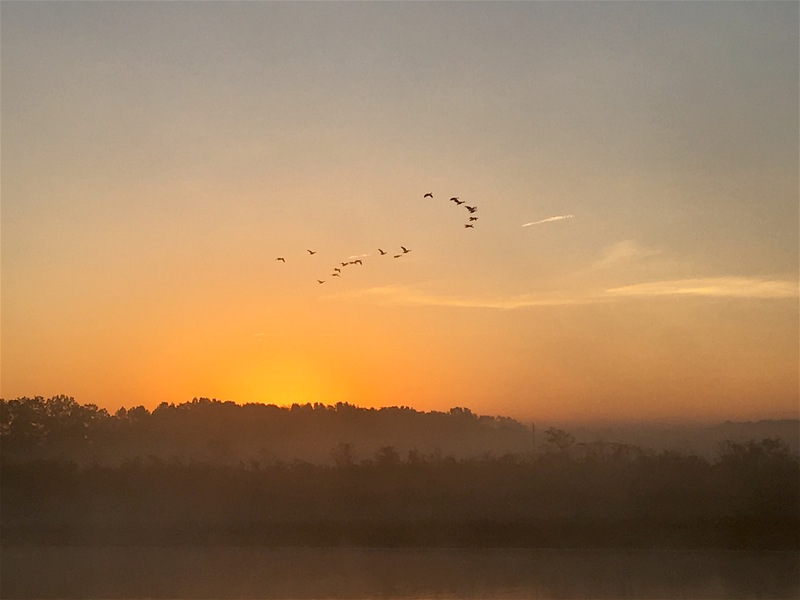 Our route took us 190 miles on the Tennessee River to connect with the Tennessee-Tombigbee Waterway. The first night we met up with Kit and Pam Kersch (pictured right) who we originally met in Georgia but had not seen since early June. 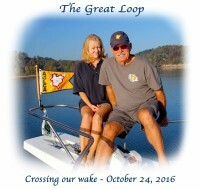 They had just crossed their wake and were flying their gold burgee, an indication they had completed the Loop. We had a chance to celebrate with them at Paris Landing State Park, on Kentucky Lake. 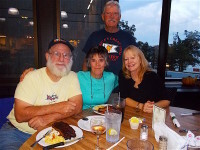 We were together the next 3 nights with them (Pebble Isle Marina, known for their free morning cinnamon rolls, Double Island anchorage, and then at Pickwick Landing State Park) and really enjoyed our time together again. Due to a delay getting through Pickwick Lock, we got into Pickwick Landing State Park just as it was getting dark. 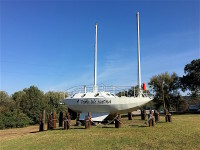 Leaving the next morning at daybreak, we went the few miles to Aqua Yacht Harbor Marina where we spent a couple of days visiting Shiloh National Military Park, the Tennessee River Museum in Savannah, TN, and Ivy Green, Helen Keller’s home in Tuscumbia, MS. Beyond the touring, we really enjoyed the peacefulness of river system. Kentucky Lake was beautiful! After celebrating with Kit and Pam, we began dreaming of gold ourselves and looked forward to our own crossing in Mobile, AL just 450 miles south. Here it is – the stopping point for those who don’t want to wade through the details. Unfortunately, there’s a lack of pictures this time as we sadly had a technical failure and lost a bunch of them. Thanks for stopping by. Details – A beautiful day dawned as we pulled off the Buzzard Rock Marina dock after having our boat there for a month (though we were away for 2 weeks). 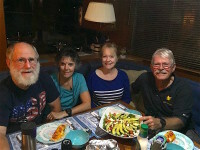 A few days before we left, we talked with Kit & Pam Kersch who had their boat, India Jayne, a few miles away at Kentucky Dam Marina where they had days earlier “crossed their wake” (completed their Great Loop). We had become good friends, staying in touch by text or email though we had only been together twice during the whole Loop. (We first met at Jekyll Island, GA, and then saw them again at Half Moon Bay north of NYC.) We were hoping to get together again as we both made our way south, and it turned out we were both ready to leave the same day. 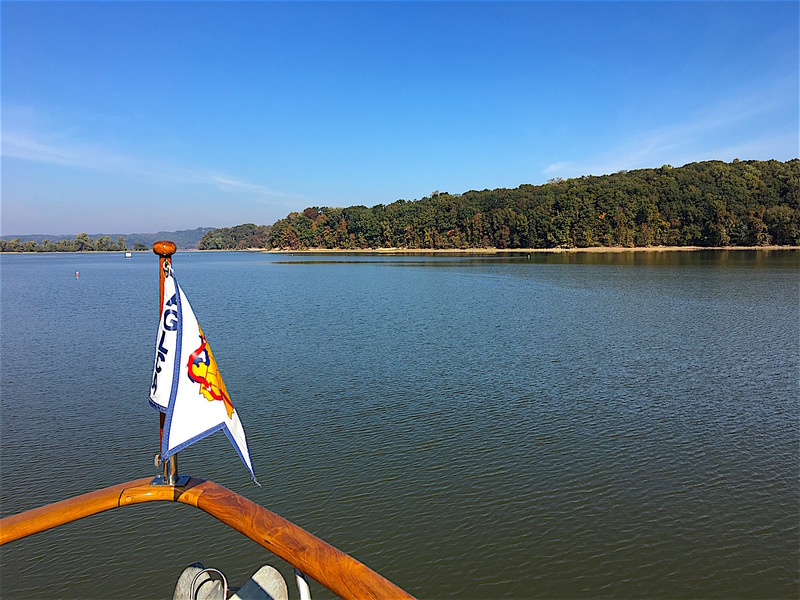 We retraced the water about 5 miles north on Barkley Lake to the Barkley Canal which connected the Barkley Lake on the Cumberland River with Kentucky Lake on the Tennessee River. After crossing the 1.5-mile canal, we once again turned south. 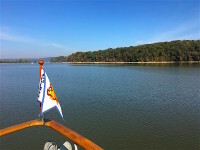 Between the 2 lakes was Land Between the Lakes (LBL), a spine of land up to 8 miles wide and about 40 miles long (270 sq. miles) designated a recreation area in 1963 by President Kennedy. While Paula drove along LBL, Tom fixed aft deck chairs and troubleshot our alternator again because one tach was not working. He determined the alternator was good, so the tach problem was likely a loose wire. It was a nice day on the lake with wind on our bow (only very small whitecaps). We could see how it could actually be a nasty lake in the wrong conditions as it was about 1.5 miles wide. 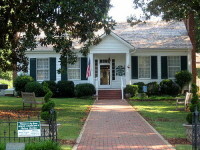 During our 49-mile day, we crossed the Kentucky – Tennessee state line and stopped at Paris Landing State Park. Before we finished fueling, India Jayne pulled in and we docked bow-to-bow with them. To celebrate the completion of their Loop, we all went to dinner at the park restaurant and caught up and talked “Loop,” sharing stories of favorite and not-so-favorite places. We both had thoroughly enjoyed our adventures and they were ready to see what was next (Florida for the winter). We, on the other hand, were still undecided on where we were going or when. Pam and Paula took a walk around the park the next morning, working off their buffet supper, and had a great time enjoying each other’s company and learning more about each other. Pam’s a lot of fun to be around, very interested in the things around her and constantly learning. As we continued south (but actually up-river against the current), it was a most fantastic day on Kentucky Lake, even though overcast. It was calm and quiet with lots of houses. There were slivers of peaceful islands barely above water. We passed a railroad bridge that ended abruptly over the water, followed by a dilapidated, abandoned storage building left standing because it was built so well it was too hard to take down. We passed 1 ferry, 1 barge, and a few fishing boats. The trees, although still not at peak, were colorful. Boating didn’t get much better. After a short day of 26 miles, we made the sharp port turn into Pebble Isle Marina. Having departed before Kit & Pam, they pulled in shortly afterward. We borrowed the marina courtesy car and all went for supplies to the Johnsonville Walmart, then put together a delicious dinner of smoked beef brisket, potatoes, and salad, completed with Tom’s homemade berry ice cream. Pam was all hyped to buy a Cuisinart ice cream maker for their boat after that because Kit loves ice cream so much and she saw how easy it was to make! While Tom gave Kit a closer look at our boat (they really liked our layout and the space we have, though we think their boat is prettier and much cleaner than ours), I taught Pam, a game-lover, Qwirkle. Kit, not a game-player, abandoned ship and we 3 played. And Pam whooped us! The next morning, over free marina cinnamon rolls, Paula asked Kit if Pam told him she beat us at our own game. He said it was the first thing she told him when she got back on their boat! He was happy we had satisfied Pam’s game craving without him. We sadly said a tentative goodbye to Kit and Pam as they were wanting to travel further the next day, though we did promise them Paula’s favorite salmon with fresh basil, tomatoes, and melted cheese if they stopped short at Double Island, our planned destination. Before leaving, we took a walk down a forest-lined road in Johnsonville State Park near the marina. 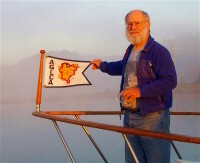 But we had to keep it short, as we needed to get going for the 53-mile day to Double Island anchorage. Once again, it was just the perfect boating day – warm, calm, water-ski smooth, with nice islands bordering the lake. There were lots of birds (including Tom’s favorite pelicans), and being Friday, there were more fishing boats on the water. More beautiful houses, some with large manicured yards, dotted the shore. As we pulled around the backside of Double Island, we saw a trawler anchored ahead. Was it Kit and Pam? Out came the binoculars. Yes! They had stopped short and as soon as our boat was rafted next to them, the salmon came out of the freezer to thaw. Some fishermen came by to chat and as we did, the majestic American Queen paddleboat passed by; we also saw a bald eagle fly close overhead. 45 minutes later, we sat down to a delicious dinner with salmon prepared by Tom accompanied by a vegetable bake, salad and cookies from Pam. It was another evening of fun fellowship. 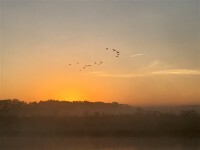 Saturday morning we awoke to a melodious cacophony of geese and cows through the fog. But the fog was thin and burned off by about 8:00. We pulled away from Kit & Pam about 8:40 for our 58-mile day to Pickwick Landing State Park. It sounds like a broken record, but it was again another beautiful day on the Tennessee River! The houses got bigger and more frequent. There were islands, beaches, lots of birds, and more turtles. We couldn’t get enough of the beauty of the area. 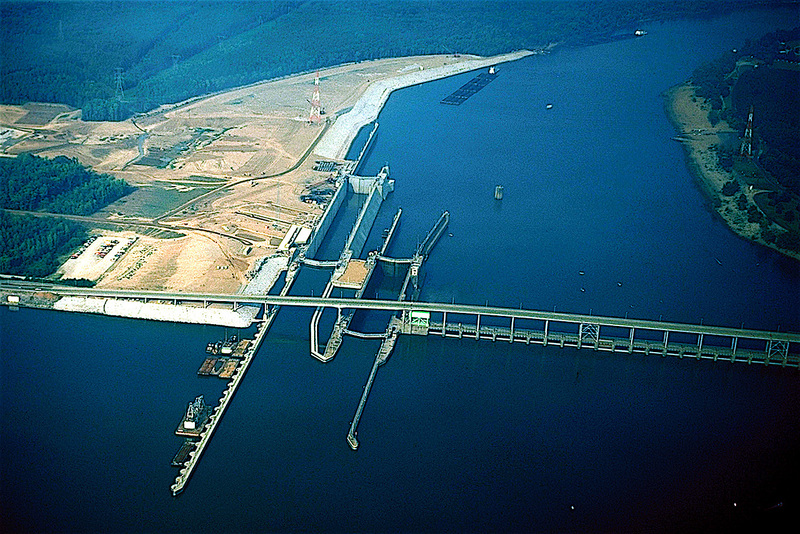 When we arrived at Pickwick Lock at mile 206, we had a 45-minute wait to get in, then it took another 45 minutes to lock through. 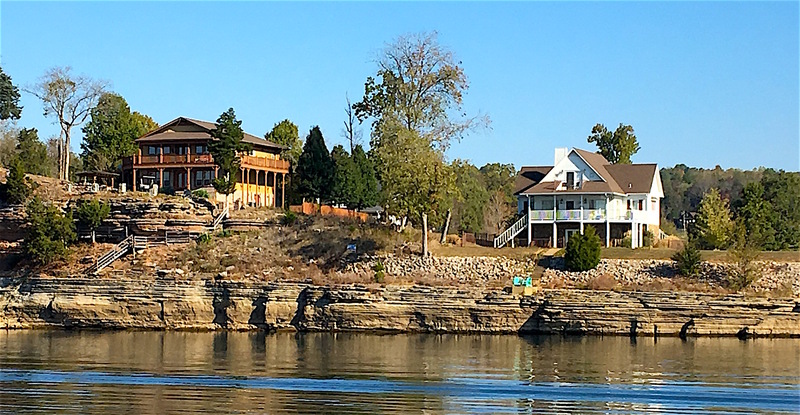 By the time we got to Pickwick Landing State Park just past the lock, it was almost dark – way past our comfort zone with getting settled at the end of a day. There were a few welcoming hands to help us tie up next to Kit and Pam. We met Gerald Whitman and Barb Murcott on Hard Dock Café, Canadians who Kit and Pam had met previously. We soon put together dinner on India Jayne and Paula made brownies for everyone to share as Gerald and Barb came over to visit after we ate. Though India Jayne and Hard Dock Café were in no hurry to leave the next morning, we had plans. We slipped our lines and were back out on the water at 7:15 to go the short 10 miles to Aqua Yacht Harbor, Iuka, MS, giving us almost a full sightseeing day there after our arrival. We had come into Pickwick Landing after the office closed and left before they opened, so never talked with anyone at the marina. When we called them later to pay our slip fee, they said, “If you are that honest, you don’t need to pay.” Yes, honesty is still the best policy! 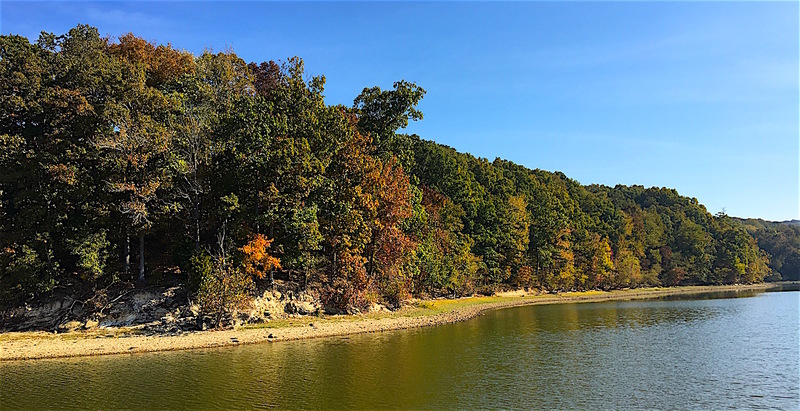 Within a half-hour of arrival, we borrowed the courtesy car and headed to Shiloh National Military Park in Shiloh, TN, about 20 miles from our marina near the convergence of Tennessee, Mississippi, and Alabama state lines. Shiloh was the site of a major 2-day battle in the Western Theater of the American Civil War, fought April 6-7, 1862. We began at the Visitors Center exhibits and then watched the 32-minute film, an excellent reenactment of the battle. Nearly 110,000 American troops clashed in a bloody contest that resulted in 23,746 casualties, more casualties than in all of America’s previous wars combined. After the movie, we drove around the park, which was very well-kept. The land originally consisted of 40 farms with the Tennessee River nearby and the landscape of trees and open fields was so beautiful in the fall colors if one could forget the carnage that took place there. The driving tour route was numbered and well-signed, with plaques erected in the direction of front lines and marked with each army name. Monuments abounded. There were so many cannons still on site. 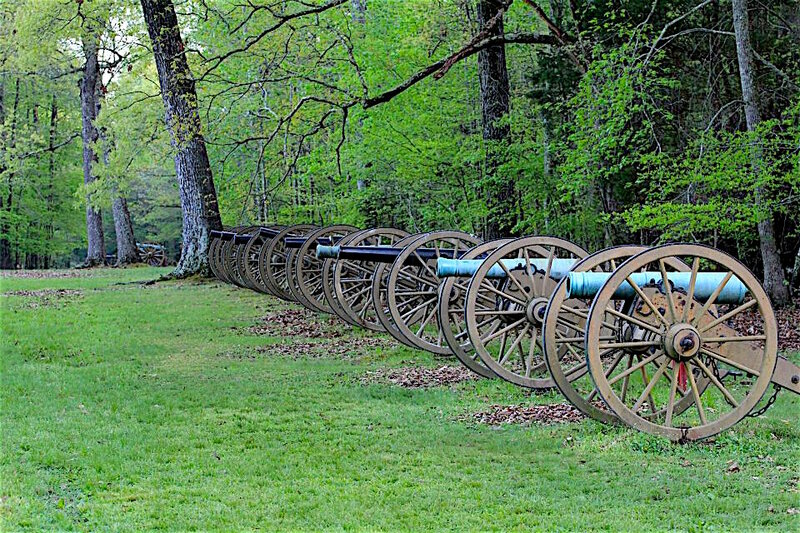 Though we aren’t historians, the park made this Civil War battle come alive. We continued on to Savannah, TN (after strolling through large Hilltop Flea Market in Crump), where we enjoyed lunch and a visit to the Tennessee River Museum. We returned back to the marina with a little time to relax before meeting up with Gerald and Barb, now also in Aqua Yacht Harbor, and picking up Kit and Pam (in another marina close by where they were having some boat work done). Kit wanted to take us to his favorite restaurant, the Rib Cage, about a mile away. It was another fun evening of fellowship and we knew this time, we’d really be saying goodbye to Kit and Pam for a while. They were in a hurry to get to Mobile to meet Pam’s son while we were ready to slow down a bit and enjoy the view. 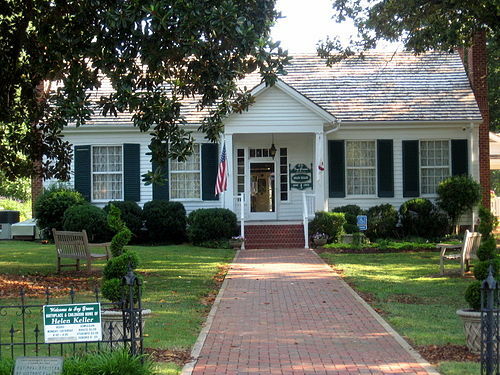 The next morning, we were able to borrow the courtesy car again and go in the opposite direction to Tuscumbia, MS where we toured Ivy Green, Helen Keller’s home. Helen’s life was depicted in the movie, The Miracle Worker. She was born a normal child but at 19 months, an illness left her deaf and blind. Our tour guide assumed the role of Helen’s aunt as she presented the house. One detail we found amusing was that after Annie Sullivan, Helen’s teacher, came to live with the family, she realized she would have to get Helen away from her parents in order to control her tantrums and teach her, as her parents catered to her every whim. Annie rode Helen around the property for 2 hours to make Helen think she had gone a long way, though they ended up at the cottage less than 50 feet from the main house! Using water from the pump pouring over Helen’s hand while spelling “water” in her other hand, Annie broke through. After realizing everything had a name, Helen learned 30 words in one day and 300 words before the end of the summer. We next drove the short distance to Florence to pick up some supplies. The downtown was quaint and lunch at Ricatoni’s Italian Grill was excellent. Unfortunately, the Rosenbaum House built by Frank Lloyd Wright home was closed on Mondays, so we will have to see it next time around. 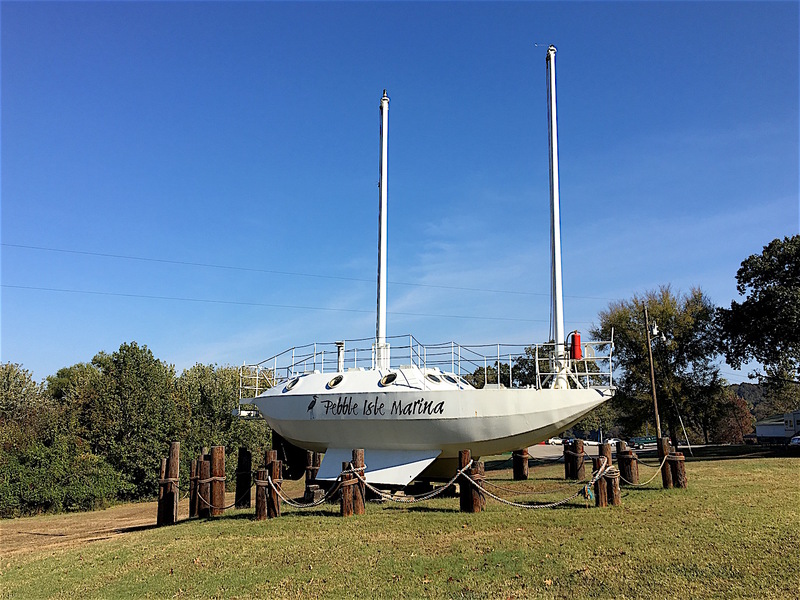 Back at the boat, Paula caught up on laundry and Tom on engine room work in preparation for our travel on the Tennessee – Tombigbee River. We did survive “green.” How long was your wait at Mrs. Wilkes this time? Wish we’d been with you!